WordPress SEO that’s Google friendly and works – use the above slideshow to get lots of great tips on how to get the best SEO for your WordPress blog or site. Some slides are linked to SEO tutorials we recommend, PDF documents, and pages on this site. Google is always changing its Algorithms and if you want your site to rank on the first page of Google for its keywords you will need to keep up to date with whats happening, or find a SEO expert to do it for you. Google “Hummingbird” Algorithm – Google has a new search algorithm, the system it uses to sort through all the information it has when you search and come back with answers. It’s called “Hummingbird” read the article from Search Engine Land – FAQ: All About The New Google “Hummingbird” Algorithm. Google Penguin – For those new to the whole “Penguin” concept, Penguin is a part of Google’s overall search algorithm that periodically looks for sites that are deemed to be spamming Google’s search results but somehow still ranking well. In particular, it goes after sites that may have purchased paid links, read the article from Search Engine Watch – Google Penguin. Google Panda – What is Google Panda? Google Panda is a change to Google’s search results ranking algorithm that was first released in February 2011. The change aimed to lower the rank of “low-quality sites” or “thin sites”, and return higher-quality sites near the top of the search results. Wordtracker.com – Google Panda update survival guide. Subscribe to the above sites to keep updated. This way any new updates will be emailed directly to your email and you will be able to keep up with all the latest updates from Google. As you have read Google looks at over 200 different things when deciding the position of a website. If you want your site on the first page of Google one of the main things is to create fast loading pages, be careful of how many images, the size of the image, scripts, plugins and anything else that can slow a page down. Next where is your site hosted? how fast is your hosting? slow hosting means slow loading pages, means poor rankings. Do a website speed test on our site, its super fast and ranks well – One of the reasons is who hosts our site, find out who we use to host our site and why on the slideshow above. Hosting plays a vital role in your WordPress SEO. Make sure you have the right hosting company. If you make your site easy to navigate visitors and search engine spiders will be able to find your content a lot easier, and this will improve your bounce rate. You could even use Silo Architecture to improve your WordPress SEO. Yarpps – Related Posts Plugin for WordPress. The related posts plugin looks for related posts on your blog and places a link to the post on the related page. This helps visitors and spiders find related posts on your site and you should install this plugin to improve your WordPress SEO – click here to get the related posts plugin. Internal link Structure – is a great way to improve SEO on your WordPress blog. When placing content on your site think internal link structure, use anchor text rich keywords in the content and where ever possible link to other internal pages on your site, this will help the reader and spiders move more easily around your site. External Links – Try to link out to high ranking good quality sites. Each page or post you build should also have a few out bound links to pages with the same topic as the page you are building. Do a search for the keyword of the page on Google and use any of the websites that are on the first page for the search term used. Those website will be high quality. Include two or three out bound links at the bottom of your page, or in the content. By recommending those sites you are also helping to boost your page for that keyword, as Google will follow those links and those pages are ranked for that keyword. Dead or Broken links can also effect your WordPress SEO. Pages on your site that have been deleted have you removed all the links to those pages? What about out bound links from comments or that you have recommended, when was the last time you checked if they are live? Dead and broken links will harm your sites reputation with Google. You can use the broken link checker to find dead or broken links on your site, it will scan pages on your site and give you a report of the page the broken link is on and the url of the broken link. Use the broken link checker at least once a month and remove any dead or broken links on your site that it finds, this will be good SEO practice. Make sure you have a site map. Sign up to Google Webmaster tools, also submit your site to Google Webmaster tools. Sign up to Bing Webmaster tools also submit your site map to Bing Webmaster tools. Content is King remember this. Have unique content that is well written and plenty of it, never copy from other sites and include keywords. Add new pages or have a blog and post on it at least twice a week. Google loves a site that is updated all the time. 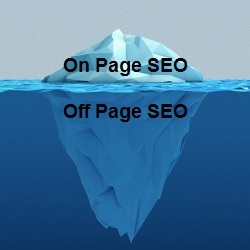 Off Page SEO – refers to techniques that are used to improve the position of a website in search engine results. Off Page SEO is link building (building in bound links to different pages on your site) and promoting your site where ever possible. Check for grammar and spelling mistakes on each page with the website spell checker. Remember take your time with your WordPress SEO if you get it right each page on your site has the opportunity to rank on the first page of Google.